My friend, we’ll call her Amy, has been struggling with digestion issues, and has been advised to avoid dairy. 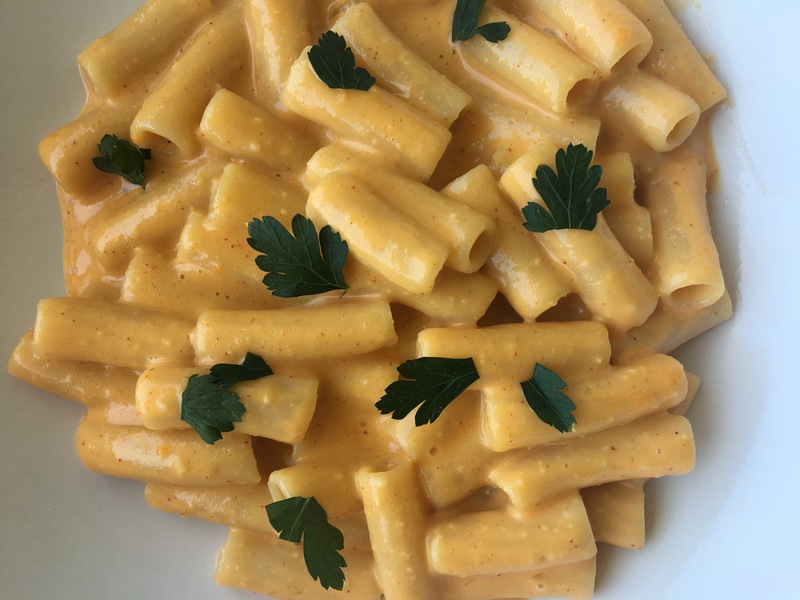 As an avid lover of dairy myself, also the wife of a French guy who can eat dairy all day long with no incident, I was initially skeptical that I could make anything vegan that resembled this beloved dish. Nope, I thought, not gonna happen. Then I stumbled upon this recipe from the Minimalist Baker (seriously amazing resource for plant-based food) and fell in love with this recipe. It’s only got a handful of ingredients and – I am not kidding – tastes almost like the real thing, even the texture of the cheese sauce is legit! I was thrilled to be able to bring Amy this version of mac and cheese, which almost brought her to tears. Prior to being told to cut dairy out of her diet, mac and cheese was one of her favorite foods, and she was uber excited to be able to enjoy it again. I also brought out a batch of this recipe to some friends, one of whom is a self-proclaimed mac and cheese aficionado – and he LOVED it. I’ve taken MB’s recipe and tweaked it a little, to cutting out the roast garlic (which makes this recipe quicker to throw together), and adding in a few things, including roasted red bell pepper, which gives it that orange “blue box” look. The result? A healthier, plant-based, gluten-free version of mac and cheese with all of the unctuous goodness of the real thing. YUSSSSSSS. You’re welcome. Put ingredients into a food processor and pulse until the consistency reaches that of Parmesan cheese. Store in an airtight container. Bring a large pot of water to boil on the stove and cook penne according to directions, drain, and set aside. You should be able to make the sauce at the same time the noodles are cooking. In a stainless steel saute or sauce pan, heat the oil over medium heat. Add minced garlic, gently cooking until the garlic turns golden (do not overcook!). Add the arrowroot starch and which a wooden spoon, mix it with the oil until it forms a thin paste-like roux. Then slowly add the coconut milk and mix vigorously with the spoon – it will go a little lumpy, and that’s totally okay. Cook for 2 minutes, then transfer to a blender (I use a Vitamix). Add the sauce base, the spices, the roasted red pepper, nutritional yeast, apple cider vinegar, and vegan parmesan cheese. Blend for 30 seconds or so, trying to get as smooth as a consistency as possible – in a Vitamix, it may go quicker than that. Taste it, season with salt, pepper, and nutritional yeast as you like it. Pour the sauce back into the saucepan, set over low-medium heat again and stir occasionally for 2-3 minutes, as the sauce thickens. Add cooked penne to the sauce, stirring to coat. You can serve it as is, or top it with more vegan parmesan. Thank you! I am super happy that it has passed the taste tests of my husband, my cheese-loving friends, and every single person that has tried it so far. It’s become a staple in our house.